Kicking off the New Year�s Day schedule are two bowls featuring battles between the Big Ten and the SEC as these two college powerhouse conferences battle for bragging rights for another season. This will be the 14th consecutive Outback Bowl featuring the Big Ten and SEC while the Capital One Bowl heads into a 16th season matching the two prestigious conferences. The Big Ten has dominated the Capital One Bowl in recent seasons, winning four straight, with Georgia earning the last win with a victory over Purdue in 2004 while the SEC has controlled the recent Outback Bowl match-ups, winning three of the past four. Looking at the four teams in these contests, both Iowa and Michigan State are looking to cap off successful seasons on a high note while South Carolina and Georgia want to end what are considered to be disappointing campaigns with a win before heading into the off-season and looking ahead to next year. Time to take an in-depth look at the first two games in the new year of 2009. Iowa heads to Tampa red-hot after winning their final three games and five out of their last six to finish the season at 8-4 overall and 5-3 in the Big Ten. The Hawkeyes return to the post-season after a one-year absence as they visit the Outback for the third time since 2003, where they have split two prior meetings with Florida. This will be the first meeting between these two programs in their history. After starting the season strong, South Carolina limps into the post-season after losing three of its final five games. Carolina finished the season with a 7-5 record and a 4-4 mark in the SEC, good enough for a third place finish in the East Division. Like Iowa, the Gamecocks return to the bowl scene after missing out in 2007 and this will be the schools third appearance in the Outback Bowl. The Gamecocks rely on their passing game to lead the offense and will likely feature both quarterbacks in Chris Smelley and Stephen Garcia, with Garcia earning the starting nod. The quarterbacking duo direct an aerial game that posted 219 yards per game but struggled with critical mistakes as the Carolina signal callers tossed 20 interceptions on the season. The Iowa pass defense has been tough and features the Big Ten leader in interceptions in Pat Angerer who reeled in five receptions from opposing quarterbacks. Carolina has struggled this season to develop a legitimate running game, and they have yet to find the right combination. The leader of the Gamecock ground game is Mike Davis, who rumbled for 571 yards and three touchdowns on the season. The Iowa rushing defense is ranked tenth in the nation and only gives up 98 yards per game, so it looks to be a long game for the Carolina running game. The Hawkeyes will line up and pound away with Shonn Greene from the opening whistle to the final gun. The Doak Walker award winner rushed for 1,729 yards and 17 touchdowns on the season as he led an Iowa rushing attack that averaged 189 yards per game. Carolina has played well against the run, allowing 129 yards per game, but Greene will provide their stiffest challenge of the season. With the Iowa offense revolving around Greene, the passing game has not been required to be a huge part of the Hawkeye game plan. The Iowa aerial game averages 185 yards per game behind quarterback Ricki Stanzi, who tossed 13 touchdowns on the season versus seven interceptions. Stanzi will face a huge challenge against a Carolina pass defense that is third best in the nation and gives up only 160 yards per game. The top player in this game is Shonn Greene, the nation�s second leading rusher. Greene averaged 6.2 yards per carry and ran for over 100 yards in every single game of the season as the workhorse of the Iowa offense. For South Carolina, their star is wide receiver Kenny McKinley, who led the Gamecocks in receiving even while missing three games due to injury. McKinley was a big time player late in the season and must continue his hot streak for the Carolina offense to have a productive game. The Carolina rush defense struggled down the stretch, giving up big yardage on the ground to both Florida and Clemson. If the Gamecocks do not rebound to prior form, Greene will control this game on the ground for Iowa. Carolina does not have enough offensive firepower to keep up if Greene gets rolling, so the focus for the Gamecocks will be on containing the run and forcing Stanzi to win the game for Iowa. That game plan is easier said than done as no team has been able to shutdown Greene this entire season. Georgia makes their way to Orlando to try and end a disappointing season on a high note. The Bulldogs completed their season at 9-3 overall and 6-2 in league play, good for a second place finish in the East Division. This game will mark the fifth appearance for Georgia in Orlando with the Bulldogs recording a 2-1-1 mark in those contests including a 34-27 overtime win over Purdue in their last visit in 2004. Michigan State is looking to cap off a strong season for the Spartans, one that saw MSU win nine games and finish in third place in the Big Ten. The Spartans make their first appearance on New Year�s Day since the 2000 Citrus Bowl, a 37-34 win over Florida. This game will be only the second meeting between these two programs, with Georgia winning 34-27 in the 1989 Gator Bowl. The Bulldogs are led by their high-powered passing game, under the direction of their star quarterback Matthew Stafford. With the help of his receivers Mohamed Massaquoi and A.J. Green, Stafford leads the nation�s 16th best passing game, which is posting 280 yards per game. Keep an eye on the freshman Green, who really has emerged during the season to provide a great downfield threat. Michigan State will give up yardage in the air, so expect big numbers out of this group. Although he has not had a tremendous season by his own standards, running back Knowshon Moreno is still a huge threat on the ground who must be accounted for on every play. Moreno ran for 1,338 yards and 16 touchdowns on the season, including rushing for over 100 yards in seven games. The Michigan State rush defense gives up 148 yards per game so Moreno will receive plenty of opportunities to showcase his talent in this contest. 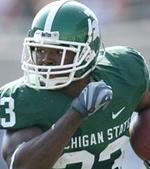 For The Spartans, the offense revolves around one key player in running back Javon Ringer. The nation�s third leading rusher averaged 133 yards per game on the ground and scored 21 touchdowns as he single handedly accounted for all but 71 rushing yards for the team. Expect the Spartans to continue to showcase Ringer and to hand him the ball at least 30 times in this game. The Georgia rush defense gives up 130 yards per game on the ground so Ringer should be able to find room to run. Leading the MSU passing game is veteran quarterback Brian Hoyer, who struggled during the season as he tossed only nine touchdown passes versus eight interceptions. Hoyer�s leading receiver is Blair White, who caught 39 passes on the season, but only one that resulted in a touchdown. Expect Hoyer to have a tough time in this game against a stifling Georgia pass defense that limited their opponents to an average of 188 yards per game in the air. This game features numerous star players that are worth keeping an eye on, beginning with the two running backs in Knowshon Moreno and Javon Ringer, who ran for a combined 2,928 yards on the season. Georgia also features veteran Matt Stafford at quarterback and his new favorite target in receiver A.J. Green. Expect both Stafford and Green to play a huge role in the Bulldog game plan on New Year�s Day as these two showcase their exceptional talents. Michigan State can hold their ground with any team in the nation with their ground game, but the Spartans have struggled all year in developing a balanced offense to help Ringer. Although the Georgia defense has not been as stifling as was expected during the season, this group is more than capable of handling a one dimensional offensive attack. If the Spartans have hopes of pulling off the upset, Hoyer must play mistake free football and keep the Georgia defense from playing eight men in the box to contain Ringer. If Hoyer does not have a great game, it will be unlikely for Michigan State to be able to keep pace with the Georgia offensive weapons.